TOKYO, June 22, 2018 /PRNewswire/ — An international collaborative research group including Tokyo Institute of Technology, Université PARIS DIDEROT and CNRS has discovered that CO2 is selectively reduced to CO when a photocatalyst composed of an organic semiconductor material and an iron complex is exposed to visible light. They have made clear that it is possible to convert CO2, the major factor of global warming, into a valuable carbon resource using visible light as the energy source, even with a photocatalyst composed of only commonly occurring elements. In recent years, technologies to reduce CO2 into a resource using metal complexes and semiconductors as photocatalysts are being developed worldwide. If this technology called artificial photosynthesis can be applied, scientists would be able to convert CO2, which is considered the major factor of global warming and is being treated as a villain, into a valuable carbon resource using sunlight as the energy source. Complexes and inorganic semiconductors containing precious and rare metals such as ruthenium, rhenium, and tantalum have been used in highly active photocatalysts reported so far. However, considering the tremendous amount of CO2, there was a need to create new photocatalysts made only with elements widely available on Earth. Professor Osamu Ishitani, Associate Professor Kazuhiko Maeda, research staff Ryo Kuriki and others of Tokyo Tech, with the support of JST (Japan Science and Technology Agency)’s Strategic Basic Research Programs (CREST Establishment of Molecular Technology towards the Creation of New Functions) for international collaborative research projects, performed collaborative research with the research group of Professor Marc Robert of Université PARIS DIDEROT and CNRS. As a result, by fusing carbon nitride, an organic semiconductor, with a complex made of iron and organic materials and using it as a photocatalyst, they succeeded in turning CO2 into a resource at high efficiency under the condition of exposure to visible light at ordinary temperature and pressure. By combining the organic semiconductor carbon nitride, made of carbon and nitrogen, with an iron complex and using it as a photocatalyst, they found that they could reduce carbon dioxide (CO2) to carbon monoxide (CO) at high efficiency. This photocatalytic reaction progresses when exposed to visible light, which is the major component in the wavelength band of sunlight. The carbon nitride absorbs visible light and drives the migration of electrons from the reducing agent to the iron complex, the catalyst. The iron complex uses that electrons to reduce CO2 to CO. The turnover number, the external quantum efficiency, and the selectivity of CO2 reduction — performance indicators for the formation of CO — reached 155, 4.2%, and 99%, respectively. These values are almost the same as when precious metal or rare metal complexes are used, and about ten times more than photocatalysts reported so far using base metals or organic molecules. This research was the first to demonstrate that CO2 can be reduced into a resource efficiently using sunlight as the energy source, even by using materials which exist abundantly on Earth, such as carbon, nitrogen, and iron. 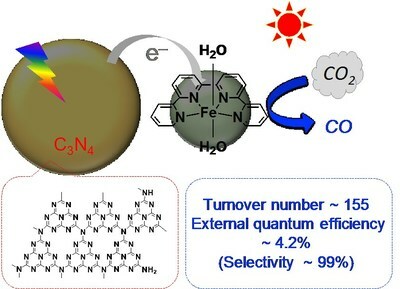 Tasks remaining are to further improve their function as a photocatalyst and to succeed in fusing them with oxidation photocatalysts which can use water, which exists abundantly on Earth and is inexpensive, as a reducing agent. In addition to the JST’s Strategic Basic Research Programs, a portion of the Japanese side of this international collaborative research was supported by Grants-in-Aid for Scientific Research (Grant-in-Aid for Young Scientists (A), Grant-in-Aid for Scientific Research on Innovative Areas planning research "Mixed Anion," etc.). Photocatalyst: Molecules or substances which promote reaction as a catalyst by absorbing light. CO: It is receiving attention as a valuable carbon resource, since hydrocarbon can be synthesized from it using methods such as the Fischer-Tropsch process. Carbon nitride: An organic semiconductor made of only carbon and nitrogen. Its structure is shown in Figure 1. Turnover number: An indicator of the number of times an active site functioned in a catalytic reaction. For example, if there were 100 active sites and 10,000 product materials were produced, the turnover number is 100. External quantum efficiency: The ratio of the amount of light which was used in the reaction to the amount of light exposed. For example, if the object was exposed to 10,000 photons and 100 photons took part in the reaction, the external quantum efficiency is 1%. Selectivity: The ratio of the desired product to the total product formed by a chemical reaction.